Bubba Carver cruises to an easy victory, under jockey Rodrigo Vallejo, in the El Nino Invitational at Hialeah Park on Saturday. HIALEAH, FL�DECEMBER 28, 2012�Rawhide Creek scored her first career stakes win in the Hialeah La Nina Invitational and Bubba Carver also got his first black-type win in the Hialeah El Nino Invitational on Saturday afternoon at Hialeah Park in South Florida. Under jockey Rodrigo Vallejo, Bubba Carver raced to a 1-� length victory over futurity winner Fast N Furious B in the $20,000 Hialeah El Nino Invitational. The WAVE CARVER gelding completed the 400 yard course in :19.886. Conditioned by Judd Kearl, Bubba Carver earned $12,000 and boosted his career total to nearly $35,000. It was the third win seven starts this season for the Douglas Traylor owned 2-year-old. Bred in Texas by Bob and Jerry Gaston, Bubba Carver is a half-brother to recent Texas Classic Futurity(G1) winner Valiant Lil Lady who has earned $485,163 this season. He is out of the Fredricksburg mare Rustys Lil Lady, a half-sister to world champion Whosleavingwho and stakes winner and #2 leading second crop sire Coronas Leaving You. 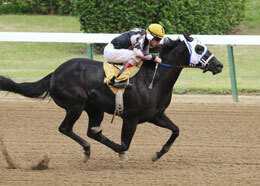 Bubba Carver was the second stakes winner this weekend bred by Bob and Jerry Gaston. On Friday afternoon Wasting No Corona, also bred by the Texas couple, won the Grade 2 Sunland Park Winter QH Derby. Kathy Germany's Fast N Furious B, winner of the Four Corners Futurity last summer, finished a game second for trainer John Stinebaugh. 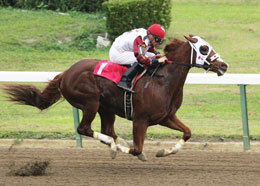 Freddie Martinez was aboard the Bielau Oaks Texas bred earner of more than $70,000 this . Deadwood Dave finished a neck back in the show position for owner Steven Wright. Guillermo Valdivia trains the Oklahoma-bred gelding. Omar Reyes had the riding assignment, picking up $2,000. Completing the order of finish were Droppin Timber, I Be Zipptin By, Ballarat, Max My Speed and Heart Of A Lion. Under jockey Freddie Martinez, Rawhide Creek ran off with a 1-� length win in the $20,000 Hialeah La Nina Invitational. The IVORY JAMES filly scored her fourth career win in eight starts this season. The $12,000 winner's purse pushed The Dutch Masters III owned filly's seasonal mark to $62,288. She completed the 400 yards in :19.801 seconds. Rawhide Creek, under jockey Freddie Martinez, cruises to an easy win in Saturday's La Nina Invitational at Hialeah Park. John Stinebaugh conditions the filly out of Pritzi Too, by Pritzi Dash. Bill Dale and Jim Streelman bred Rawhide Creek in Missouri. Ted Abrahams and Lyle Guillory's Head Trauma got up for second, earning $4,000. The filly is trained by Judd Kearl and ridden by Rodrigo Vallejo. She is a homebred for Abrahams. Still winless in four starts this season, the lightly raced Ima Wagon finished a neck back in third for owner trainer Ron Raper. Aron Hunt rode the PYC PAINT YOUR WAGON Oklahoma bred miss. Jovetta Meredith bred her from the Mr Eye Opener mare Eyesa Beauty 123. She earned $2,000 for the effort. Completing the field were One Famous Chance, Calamity Jamie, Sassifras, Arikria, DH-Edies Painted Lady, DH-Cute Ivory Girl and Bye N Corona.